It’s been a summer of gatherings; cousins for brunch pancakes and the Aussie’s parents for dinner, relatives from England for Sunday lunch and visitors who came for morning cake and stayed for omelettes. It’s been a summer of small children roaming the garden, foraging for wineberries, hanging upside down from the swings and testing the patience of Shy, our long-suffering cat. It’s been a fabulous summer. The trick is to have some easy recipes to hand so that it’s possible to pull a meal together without too much hassle. That, and plenty of eggs in the house. When all else is eaten, there’s always something egg-related – lots of recipes here – that can be whipped up quickly while talking to visitors, wrangling kids and saving the cat. 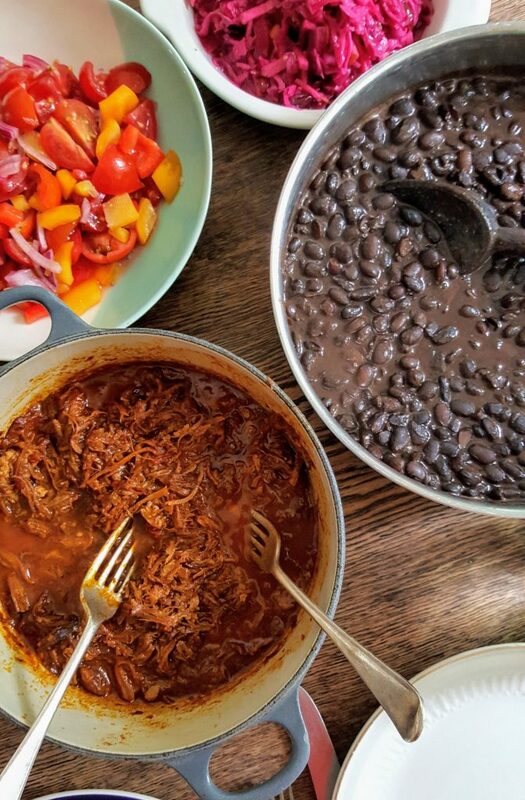 The evening beforehand, cook the conchinita pibil – it always tastes better on day two – in the pressure cooker and let it soak up the flavours. Soak the black beans overnight and put them on in the morning. Pull salads together – a simple pico de gallo (chopped tomato, red and yellow pepper, red onion, tossed together with some seasonings, fresh coriander and lime juice) is always good, along with a big bowl of green salad leaves and herbs – and there’s often some red cabbage ‘slaw in the fridge (or my mum brings it!). I cook a pot of brown rice with bay leaves and cinnamon, warm some tortilla wraps, add a bowl of natural yoghurt to the table – and we eat. However many of us are here. This makes a big pot of beans but, if you’re cooking from scratch, it’s worth making a lot and freezing some. They’re a fantastic side dish with the pork or roast chicken but are also good with a fried egg on top, used as refried beans, turned into a warming bean soup or used to bulk out a not-quite-enough for everyone stew. Place the black beans in the slow cooker bowl, cover with the water and soak overnight. In the morning, add the garlic, onion, cumin seeds, cinnamon and chilli. Cover and cook on low for 8 hours or high for 4 hours. When the beans are almost tender, stir in the salt. If, towards the end of cooking, it looks like there might not be enough water, boil the kettle and use boiling water – adding cold can shock the beans and mean extra cooking time. Fish out the garlic cloves and chilli. Mash the garlic into the bean liquor and – depending on your heat tolerance – shred the chilli and stir back in (or discard it). Serve. No slow cooker? These can be easily made on the hob. Soak, add the rest of the ingredients, bring to the boil and simmer until tender, stirring in salt when the beans are nearly cooked. Depending on the age of the beans, they will take at least an hour to cook, perhaps more. Some more useful ideas for black beans on the Food52 site here.